A single Instance is one occurrence of OSPF. Each occurrence of OSPF is running its own Back-bone area, its own link state algorithm for its own areas, and so on. Two or more instances of OSPF are not aware of anything going on inside the other instances unless “Redistribute Other OSPF Routes” is selected. If this is selected, then the learned routes can be conveyed between instances. Most networks only run one instance of OSPF, but there are special cases when running multiple instances can be advantageous. 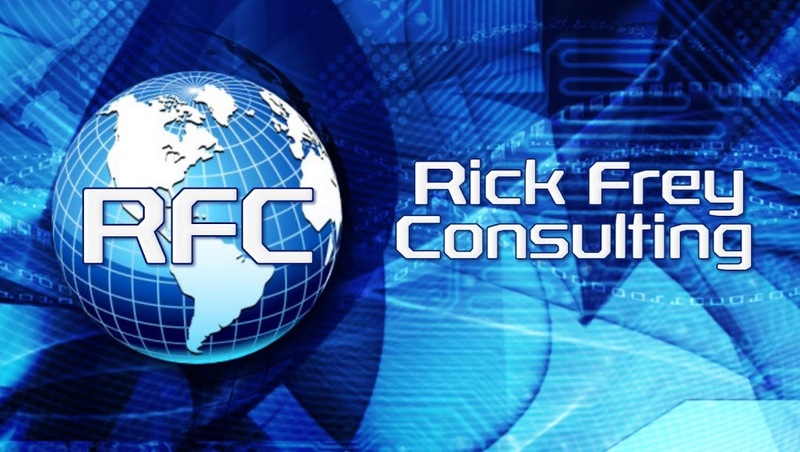 One example, would be to overcome some of the limitations that working with areas can impose. This will apply to WISPs in particular because they tend to “daisy chain” towers in a long line. Another example would be, since OSPF is able to work with separate routing tables, a different instance could be used for different routing tables. Domain-ID: This is related to MPLS and not needed for this lab. Domain-tag: Used for interoperablity with older Cisco systems. Use-DN: This is related to MPLS and not need for this lab. 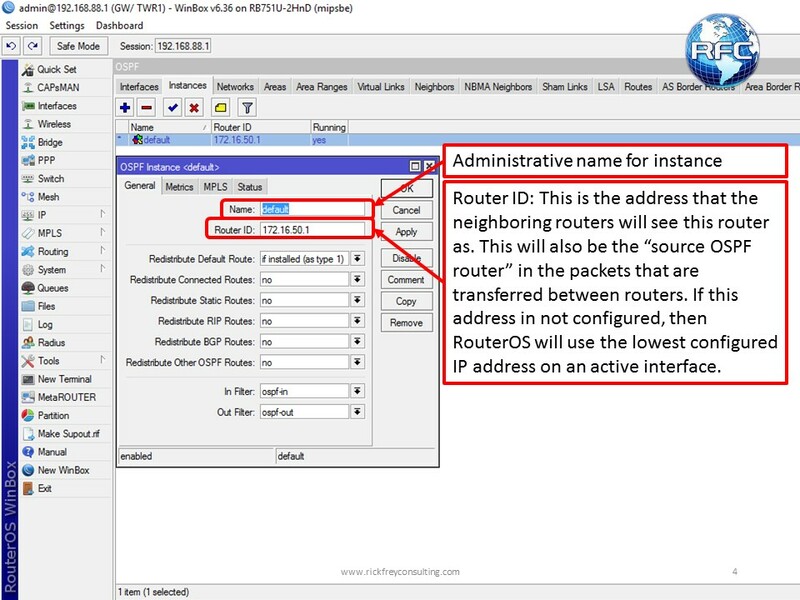 First, add all of the routers into one instance of OSPF with all of the routers participating in the Backbone Area. Observe the routing table that is created. 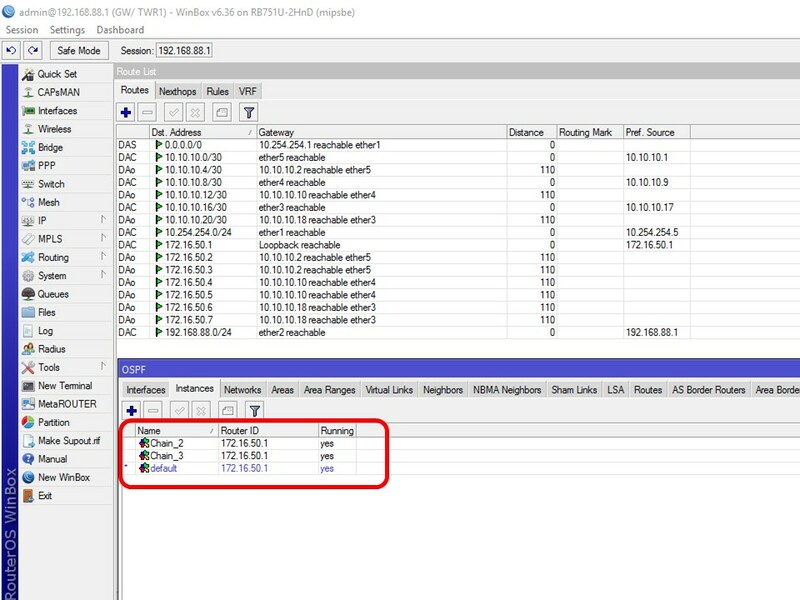 Disconnect and reconnect the links and observe how long it takes to build the entire routing table. 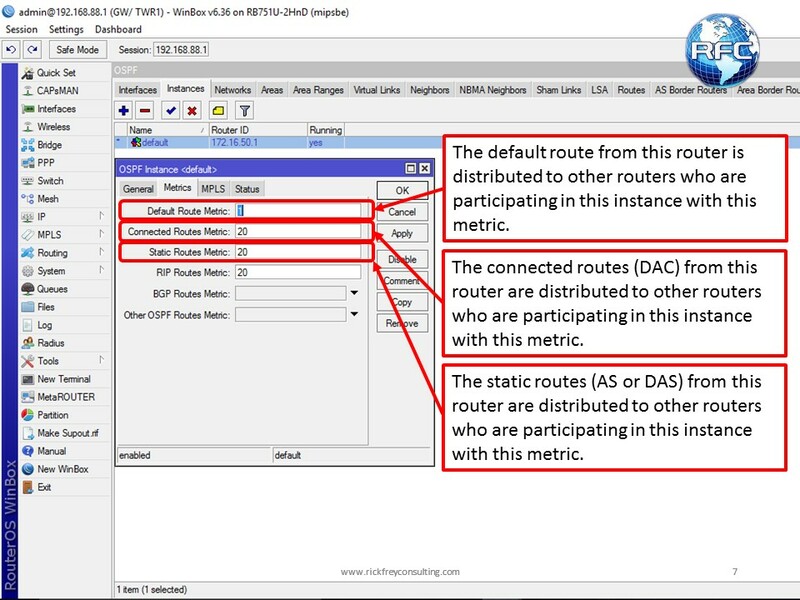 Notice that there are 16 routes on every router and every router has a complete knowledge of each subnet that is on the network. 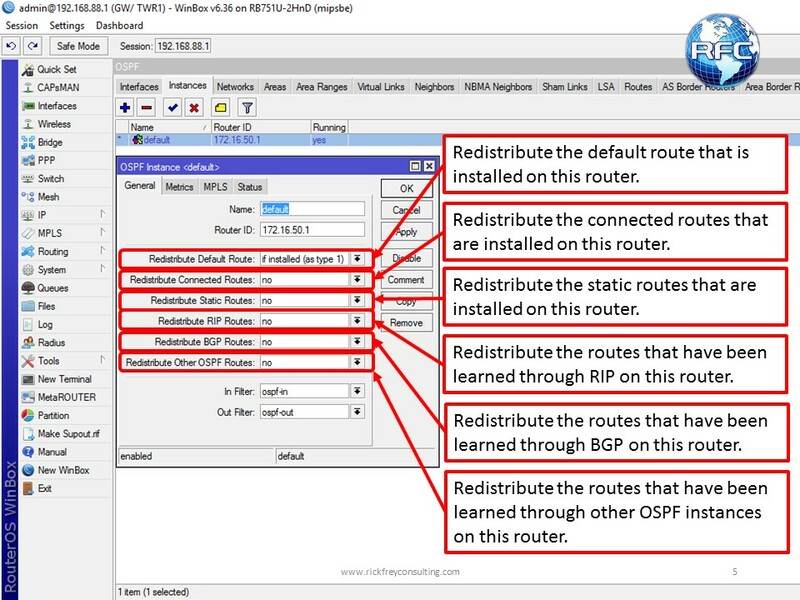 Once the instances have been set to “Redistribute Other OSPF Routes” all of the routers will have thr full routing table again. 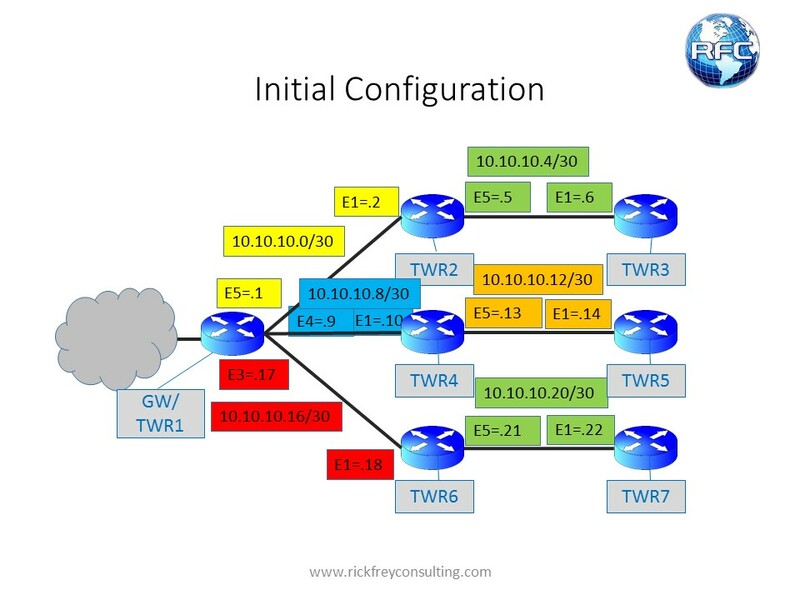 Notice that only 1 router had to have any changes in this example. The other routers have no idea that there are three instances of OSPF running. There are many situations where running multiple instances can be beneficial, especially for ISPs and data centers. WISPs will find it beneficial because they have a 3 area limitation (1 backbone area, 1 transit area, 1 area linked with a virtual link) before they have to resort to Layer 2 tunnels to connect an area back to the backbone. All of the networks that could be reached in any failure scenario will all still be available while using multiple instances, however, back-up links in this scenario get a little more complicated. Running multiple instances will use up the resources on that router faster. An argument could be made both for and against this particular example regarding link states changes that are learned and propagated. The argument being that when you are using a link state protocol, you are often using multiple paths and the multiple paths parts in this type of topology would get much more involved. On one hand, each instance has the potential to reconverge faster than if they were all part of the same instance and area. On the other hand, a well place Area Border Router could have accomplished the same thing. There are 4 Network types to the OSPF interfaces. The network type defines how the neighbor relationship will be formed. Two routers have to be “neighbors” before they can be “adjacent”. Only “adjacent” routers can exchange databases. Keep in mind, that all of these network types will work more consistently if you are using QoS methods to protect the OSPF conversations. 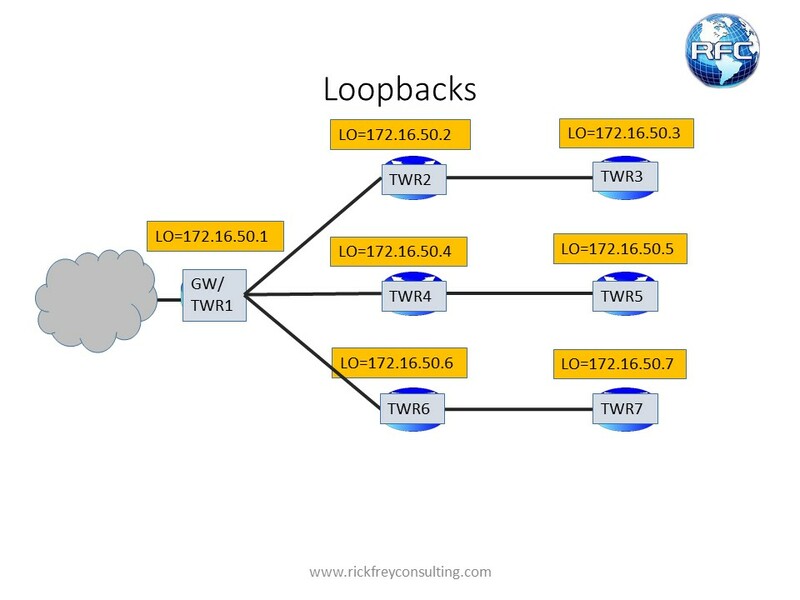 ISPs that have saturated links, have to implement QoS for OSPF. Without the QoS, the link will get saturated, the OSPF conversation will be interrupted (resulting in neighboring states and adjacency failing), the link goes down on a Layer 3 level (which ends the network saturation problem for a few moments). That allows the routers to become neighbors and adjacent again. The network traffic resumes and the whole process just keeps repeating itself. Point to Point: The simplest network type. This is used when there is only two nodes communicating. Designated Routers and Backup Designated Routers are not elected because there are only two nodes and there would not be any advantage to it. 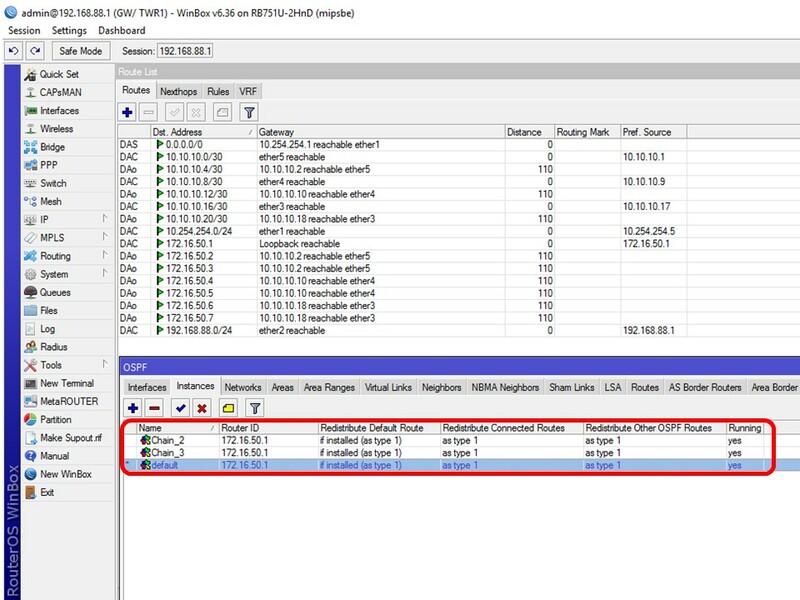 Each host sends packets from their interface address to the multicast address of 224.0.0.5. They exchange Hello packets and then the database, always sending the packets to 224.0.0.5. By the way, PTP will typically establish and reconverge faster than the other network types. For a clearer understanding of why that is, view the packet captures. The PTP captures are the simplest. 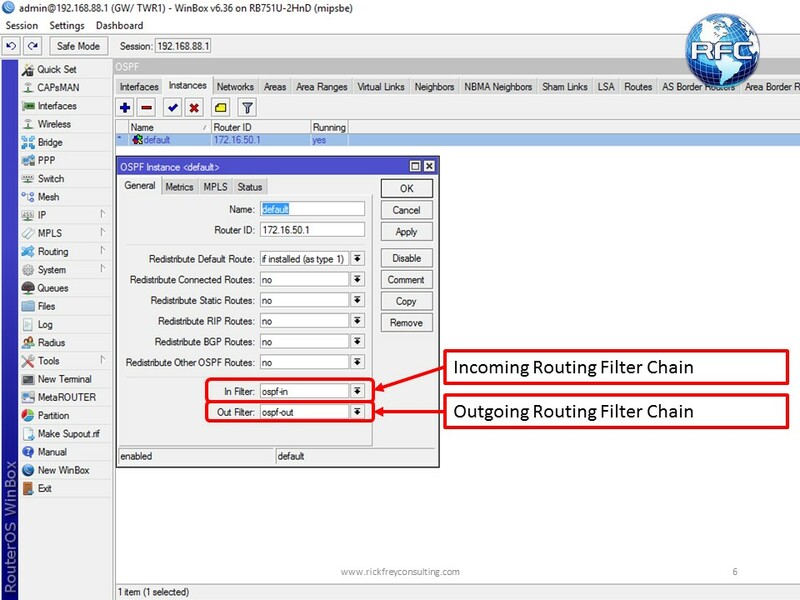 Broadcast: This network type is intended to be used when multiple routers will be participating through a switch or other broadcast domain. 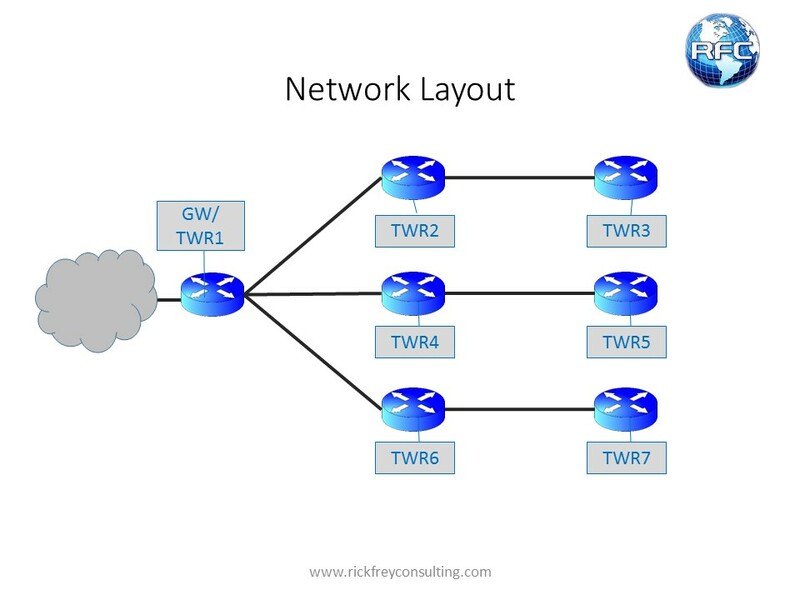 Technically, bridges, PTMP wireless, and other means of forming a Layer 2 adjacency will work, however, they are not without their challenges… For best results, use either a switch or the PTP network type and topology. The Broadcast type also uses multicast to form adjacency, but it uses two addresses. 224.0.0.6 is used by all the routers to send updates to the DR and BDR. 224.0.0.5 is used by the DR to send updates to all of the other routers. The Designated Router and Back-up Designated Router relationship is used to reduce congestion. Without that mechanism, each router would have to form an adjacency with every other router. This network type is well suited for Ethernet and Fiber networks, but it will have trouble on any network where multicast traffic is not on time, in sequence, or dropped (not well suited for many wireless networks). Non-Broadcast Multi-Access (NBMA): NBMA is usually said to be similar to the Broadcast network type, but I think those descriptions may be misleading people. NBMA is 100% unicast. One host talks to another host using their interface address every time. The overall process is similar, but a packet capture will revel that the Hello process is much longer with NBMA. In my experience, NMBA can be temperamental about reconverging and I’ve not been able to discover why. 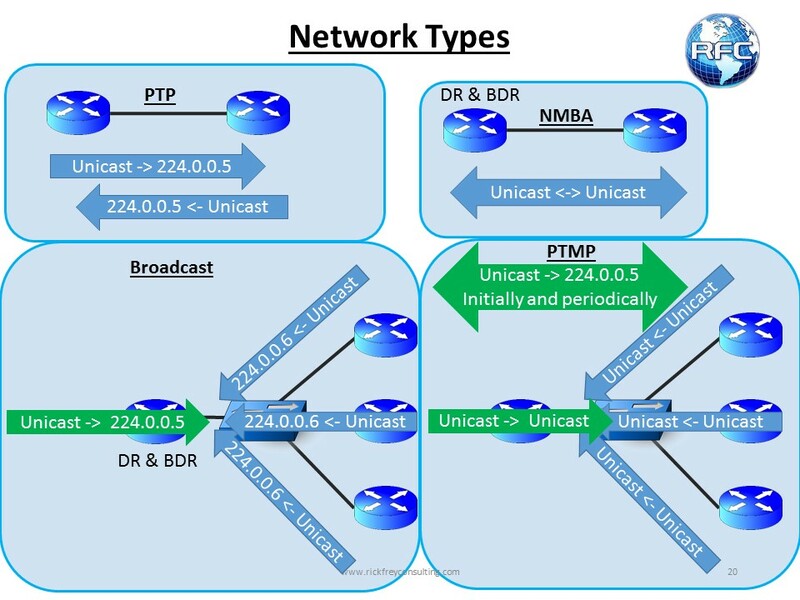 Despite that, this is the only unicast network type, so when multicast networking is not an option, this is the only choice. Since it is unicast, who the neighbor is going to be has to be set in NBMA neighbors. The setting has to be made on all routers on this link. 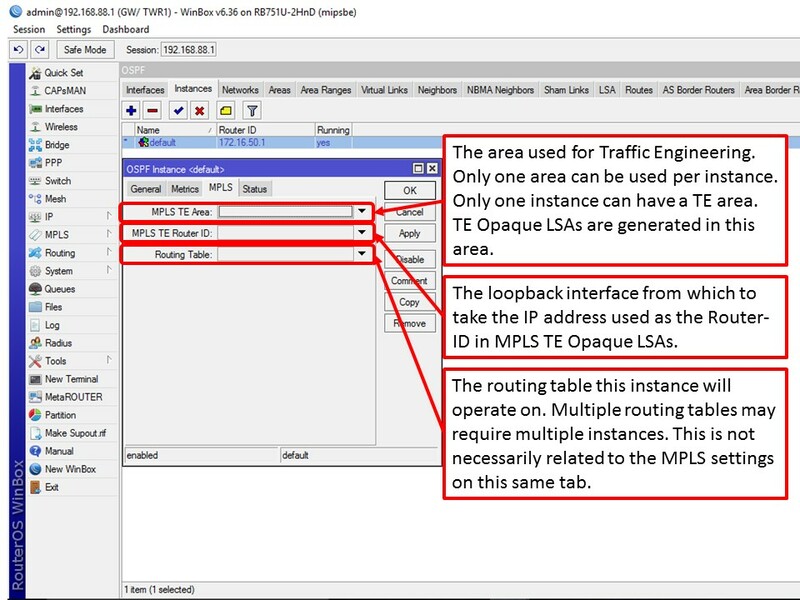 NBMA can be used when the topology is either PTP or PTMP. 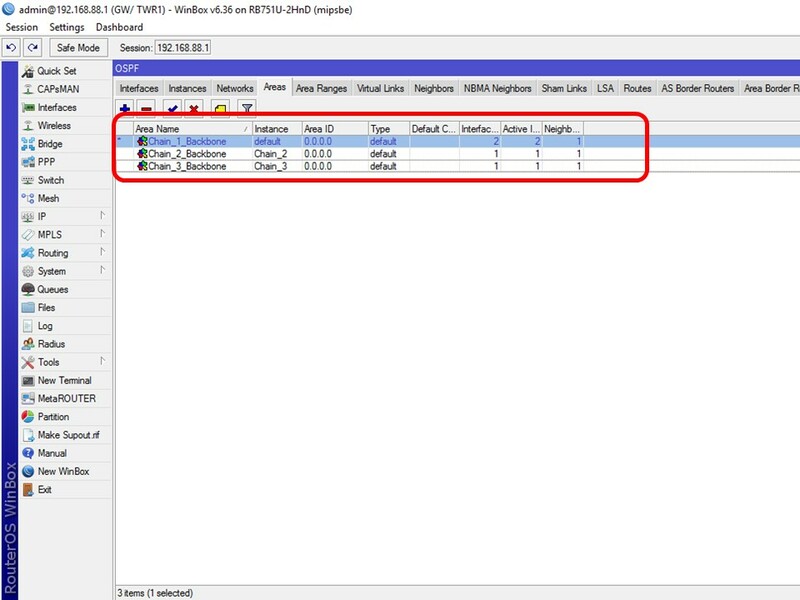 Since, it can be used in a PTMP topology, it also uses a DR and a BDR. Point to Multipoint: This network type is a combination of PTP and NBMA. It is mostly unicast, but it does use the multicast address of 224.0.0.5 for the Hello process and occasional updates. Its intended to be used in a PTMP topology, however it handles each conversation like it was a PTP connection. This means it sends more traffic than the other 3 network types. Since it is mimicking the behavior of the PTP network type it does not use DRs and BDRs. Convergence time on this network type will be as fast as PTP. 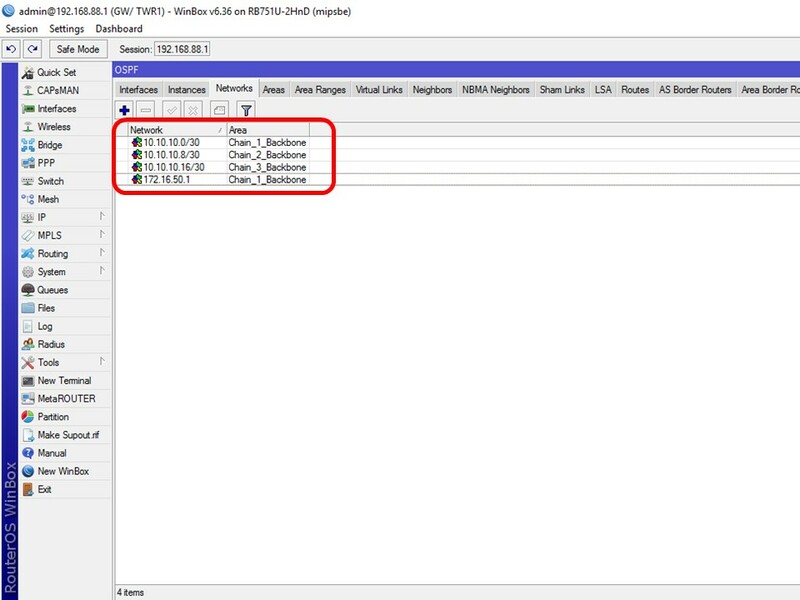 This is also the network type that MikroTik recommends to be used when Broadcast is not a working solution, such as with wireless links.